Waterslide decals and stickers included. 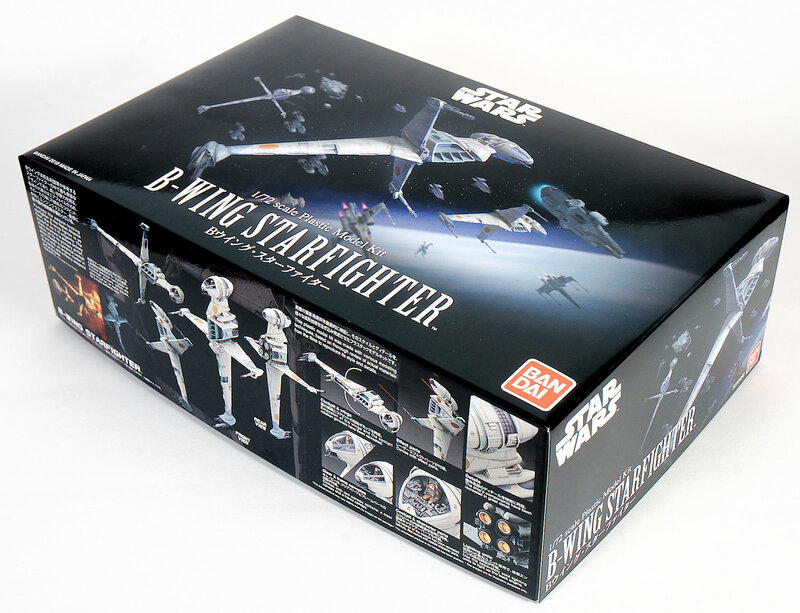 The A/SF-01 B Wing Starfighter is manufactured by the ship manufacturer Slayn & Korpil. The most advanced starfighter in the Rebellion, it had an advanced avionics package that negated the need for a navigation droid. Though slower than the X-Wing, the B-Wing had far greater firepower, hull integrity, and shield strength, which made it the perfect fighter to engage capital ships rather than TIE Fighters. 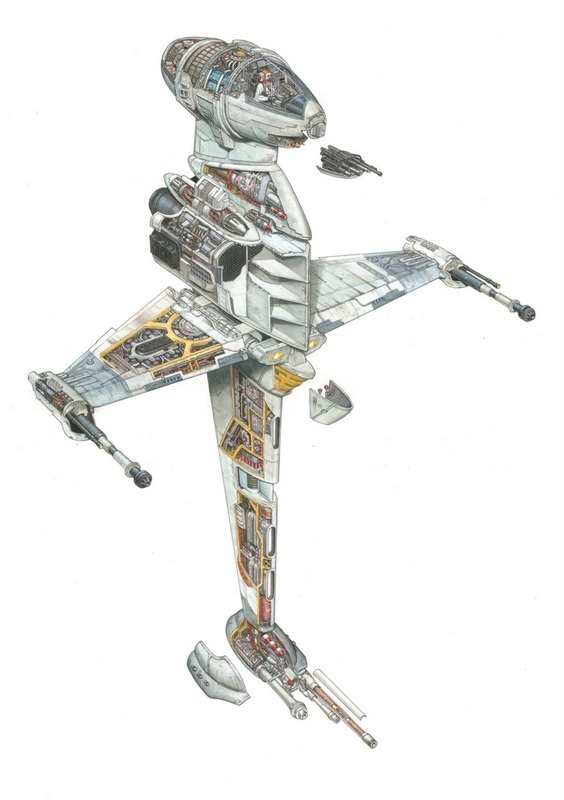 Like the X-Wing, the B-wing has S-foils running down the length of its body that carries several weapons. 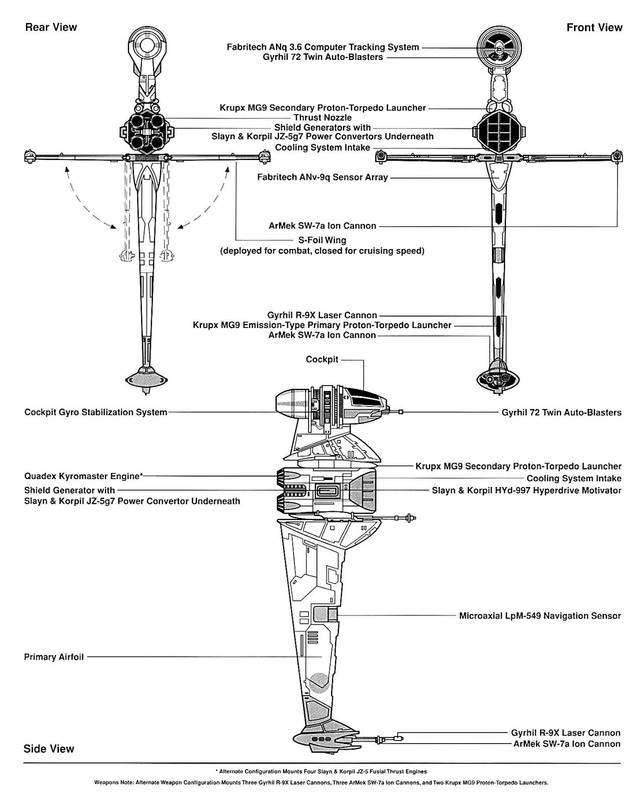 When the S-foils were deployed to combat position, the entire ship would rotate and lock into the shape of a cross. 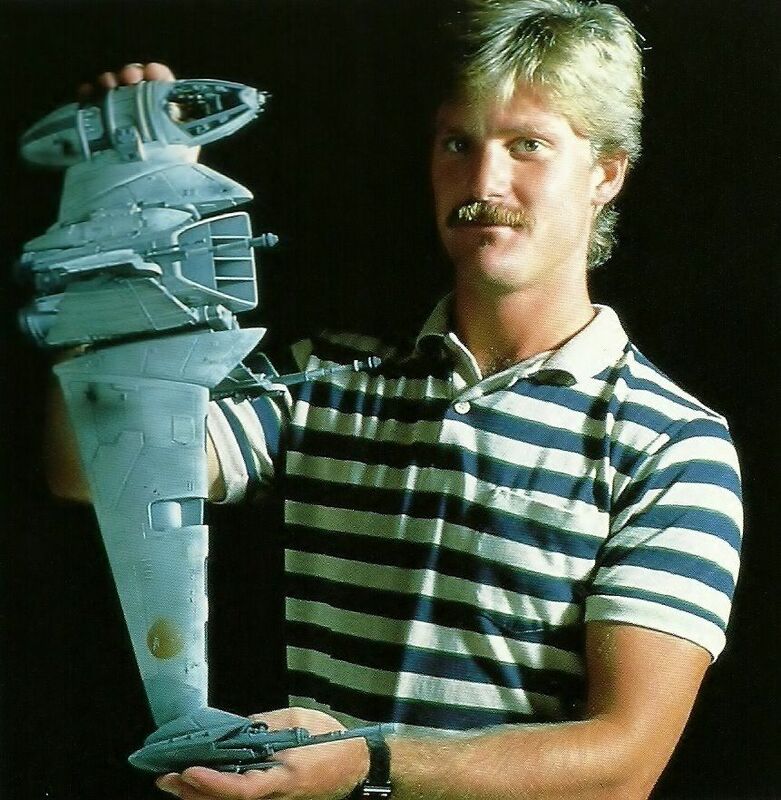 The original prototype for the ship was developed on the planet Shantipole by the Mon Calamari engineer Quarrie. 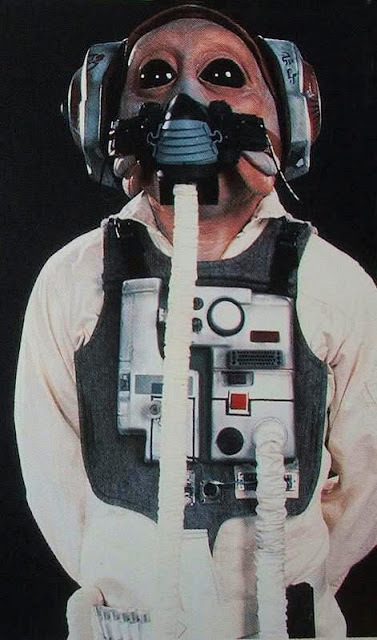 While it lacked a hyperdrive and a dedicated targeting system, the prototype was more powerful than later models but required a gunner to control the weapons. Originally nicknamed the “Blade Wing,” Rebel pilots Hera Syndulla and Sabine Wren were the first to fly the ship in a mission to break an Imperial blockade. During the lead up to the Battle of Endor, a dedicated B-Wing squadron was formed, designated Blade Squadron. 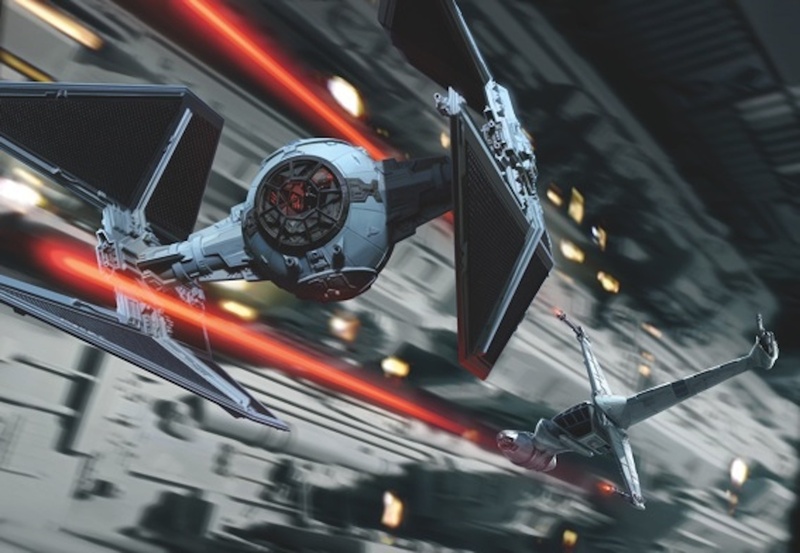 During the battle, a detachment of B-Wings followed Lando Calrissian inside the second Death Star. 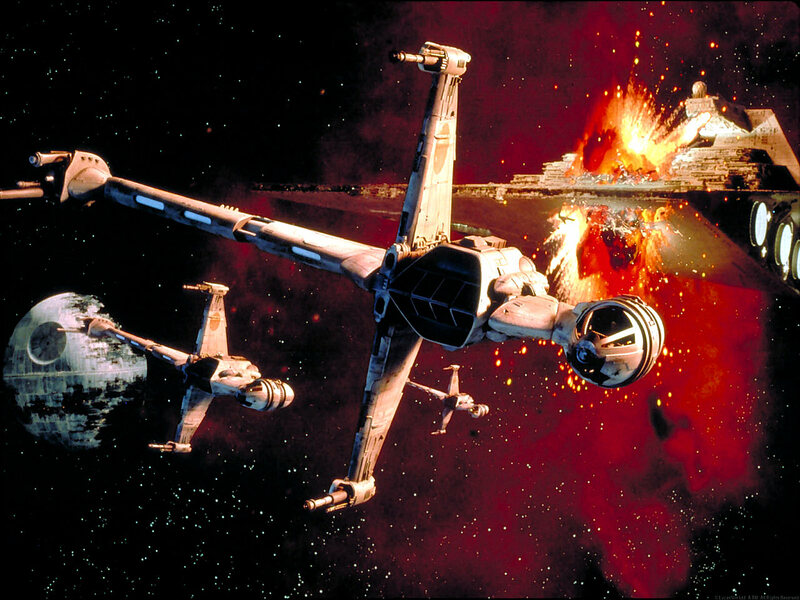 Blade Squadron was assigned to take on the Star Destroyer Devastator, which they destroyed at a great loss to their own unit. 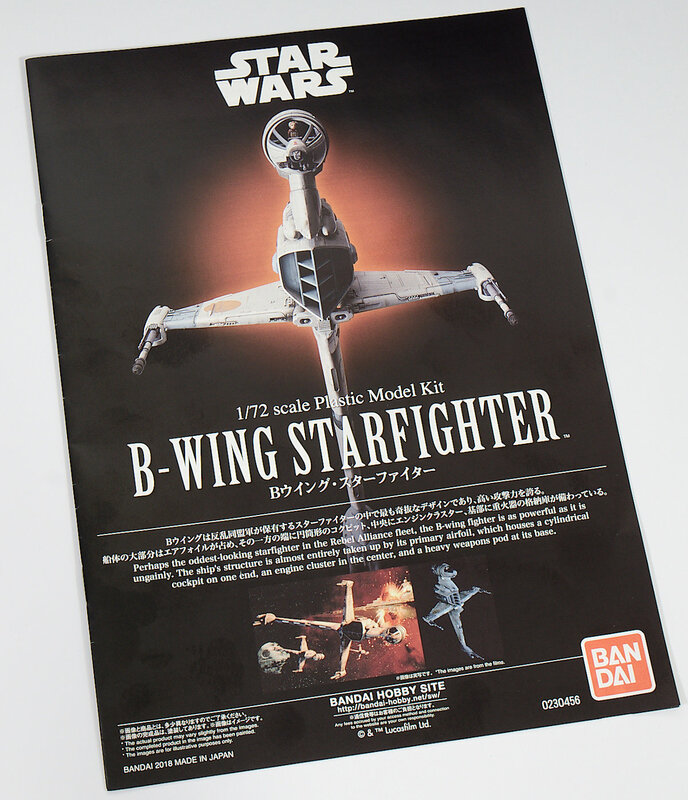 Designed by Slayn & Korpil under the supervision of Gial Ackbar shortly after the Battle of Yavin, the B-Wing was a powerful, but difficult to fly a ship that became part of the Rebel starfighter corps during the latter half of their campaign against the Empire. 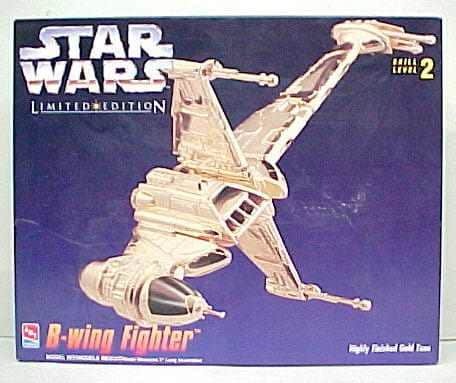 Seen as a heavy fighter, it was originally created to replace the increasingly antiquated Y-Wing, but the difficulty in mastering the B-Wing forced the Rebellion to invest in upgrading their Y-Wing fighters instead. 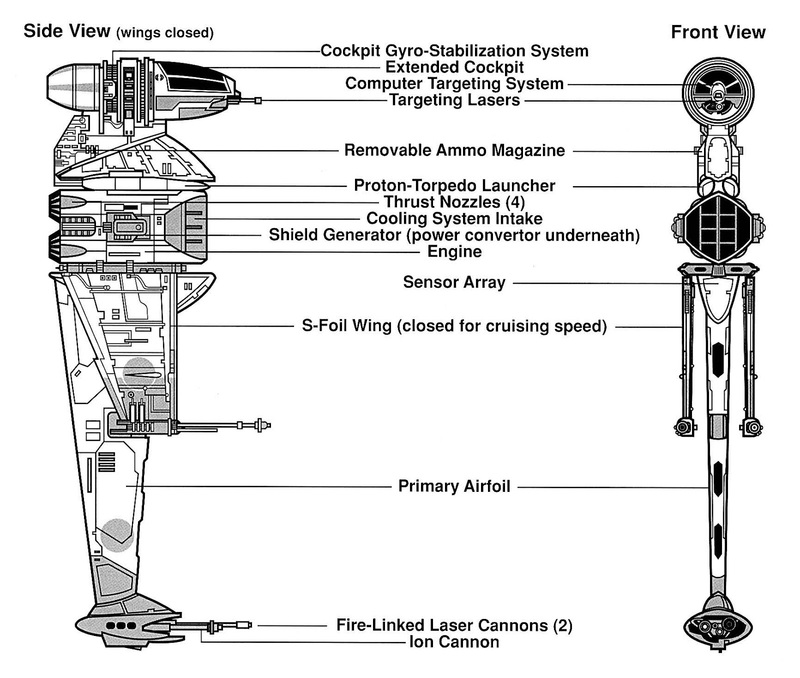 The armaments of the B-Wing were large for a fighter of its size, including three ion cannons, two proton torpedo launchers (with 8 torpedoes each), one heavy blaster cannon, and two laser cannons. The B-Wing saw its first real continuous service after the Battle of Hoth and were even used by Rogue Squadron on several missions. 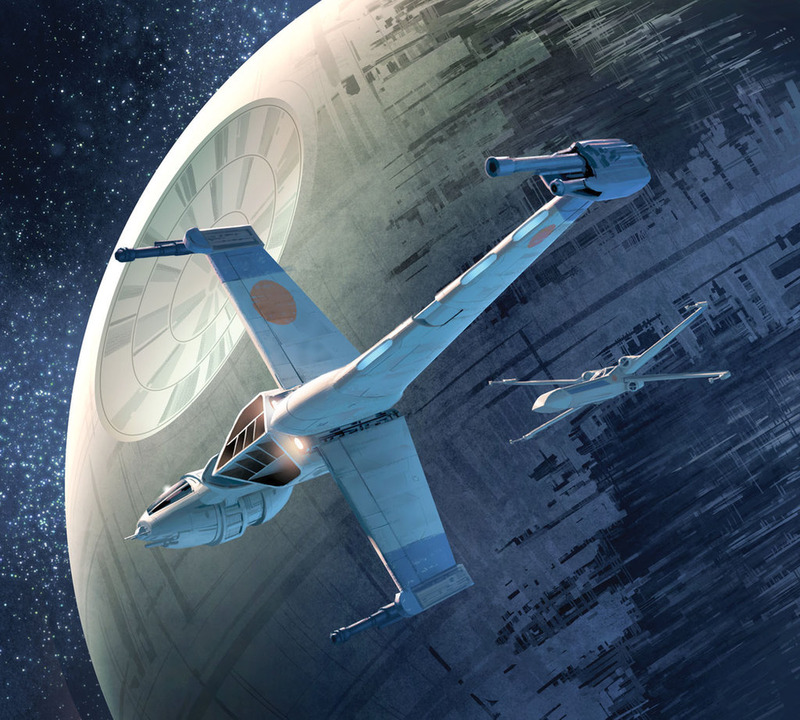 By the Battle of Endor, the B-Wing proved its worth when the Rebel fleet was surrounded by Imperial Star Destroyers. 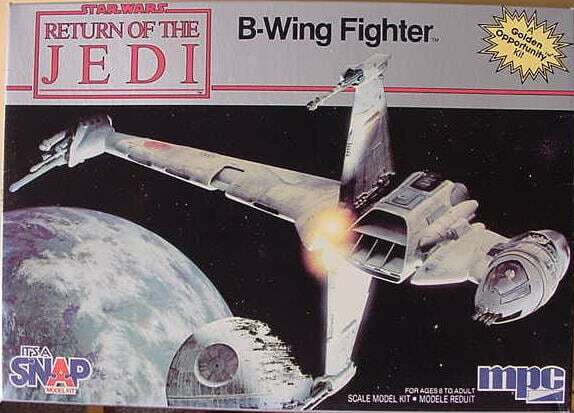 After the Rebellion became the New Republic, B-Wings remained a fundamental part of their military. They were used in several campaigns against the Imperial Remnant, including the liberation of Coruscant. Even Luke Skywalker logged time in one when the situation called for it. 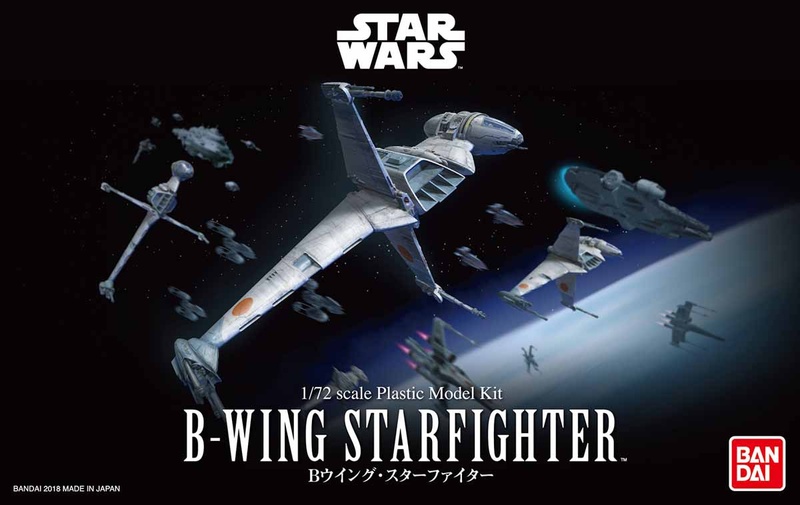 The B-Wing continued to be deployed through the Vong invasion, the Swarm War, and the Second Galactic Civil War until it was replaced by the Besh-type personal starfighter. 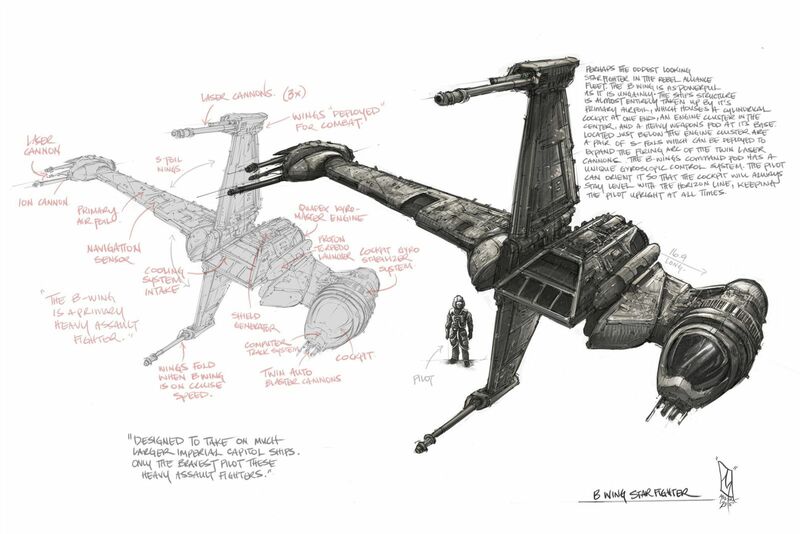 The B-wing fighter was originally designed by Joe Johnston and Bill George for Return of the Jedi. 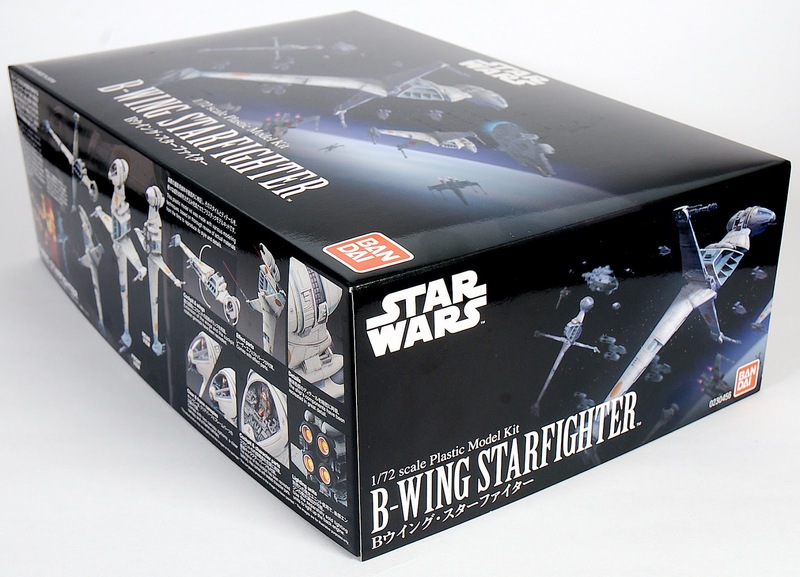 The craft derives its name from the fact that the crew labelled the two new Rebel Alliance starfighter models in Return of the Jedi as "A fighter" and "B fighter". Bill George had so much input into the starship's development, that his colleagues nicknamed it the "Bill-Wing Fighter". 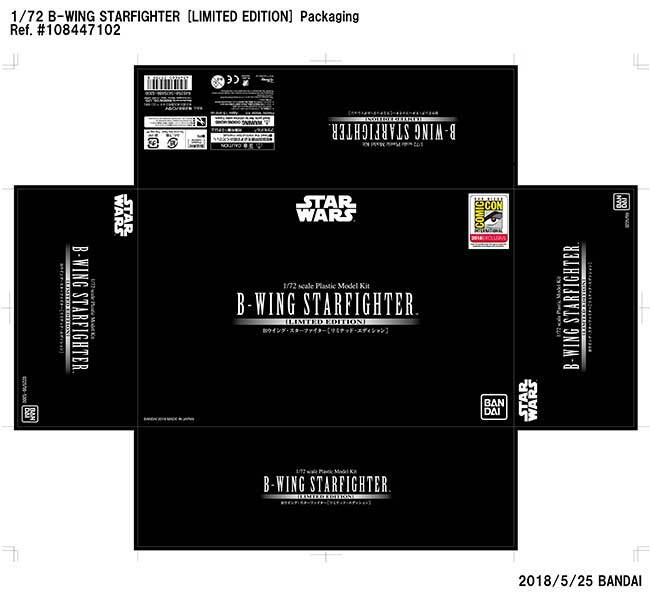 Years later in Star Wars Legends the name "Blade wing" was devised as an in-universe nickname, which was canonized by the Star Wars Rebels production team. The craft's unusually thin shape was problematic for blue-screen photography, because the model tended to blend into the star field. As a consequence, some planned sequences with the B-wing were cut from the original release of Return of the Jedi, and the B-wing is not shown in action during the Battle of Endor in the film. In fact, after the ships fly away from the still-active Death Star II shield at the start of the battle, the B-wing is hardly seen at all. The rotating cockpit design of the B-wing was based on early concept art for the Millennium Falcon. 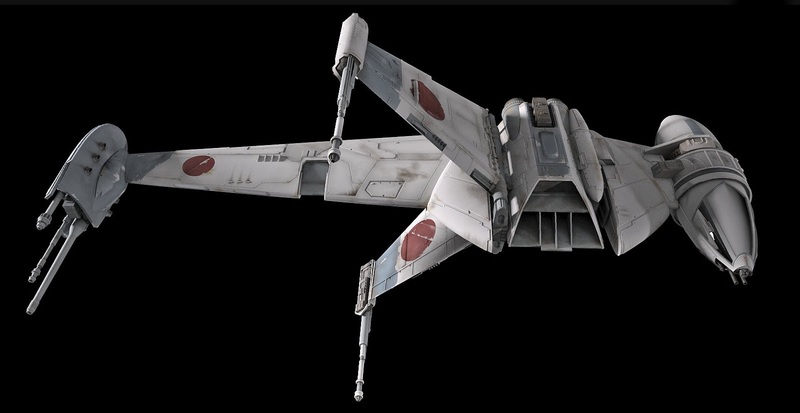 In Star Wars Legends continuity, the B-wing was said to have been designed and produced by the Rebel Alliance after the Battle of Yavin, partly as an in-universe explanation as to why the B-wing and A-wing fighters created for Return of the Jedi did not participate in the attack on the first Death Star. 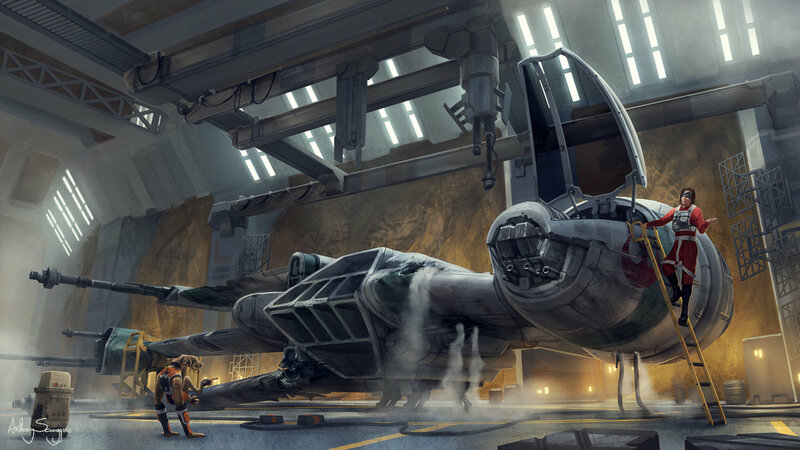 However, in the new Star Wars canon, both B-wings and A-wings are featured in material taking place well before the Battle of Yavin and have been given earlier origins. 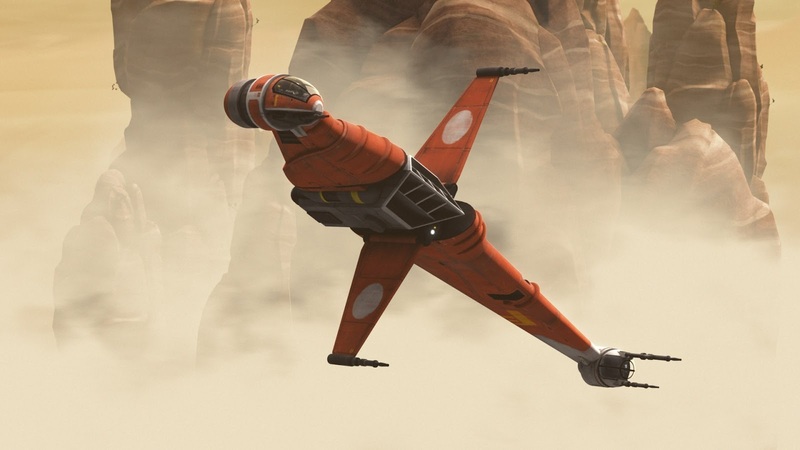 The production team for the Star Wars Rebels television series, which has featured both ships, explained that the intention is to depict different rebel cells using different fighters in different parts of the galaxy. 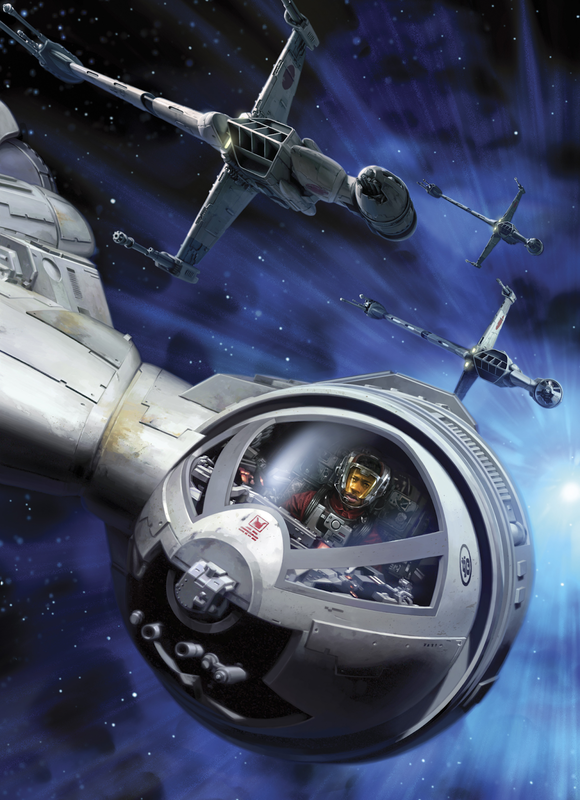 The A-wings and B-wing appear as the primary starfighters of the Phoenix Squadron in Rebels, while the rebel cell led by Jan Dodonna and portrayed in Star Wars: Episode IV A New Hope used primarily X-wings and Y-wings. The Battle of Endor, intended to show the first time the entire Rebel Alliance comes together, therefore includes both sets of ships. 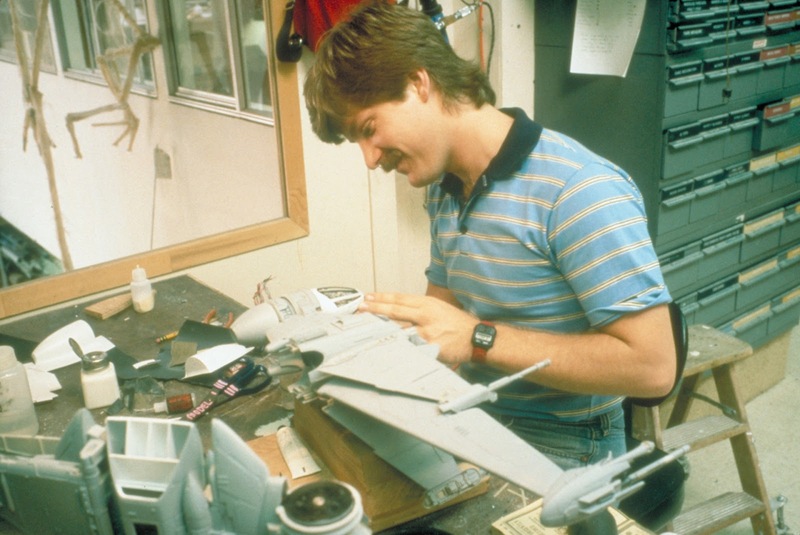 Apart from some very expensive Studio scale and scratchbuilt examples the main source fo B-Wing model making for the rest for us has been the 1983 vintage MPC 1/94th scale kit. 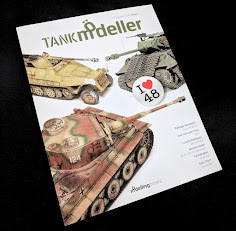 This was reboxed also by Airfix and also ERTL/AMT. 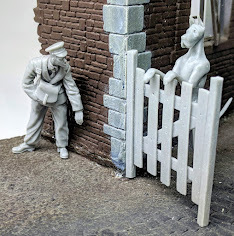 These were ok, but fairly soft in the details department and now are only really the fare for real enthusiasts - or people who enjoy stripping the plastic gold coating of that version eesh! What better time for a new-tooled kit huh? 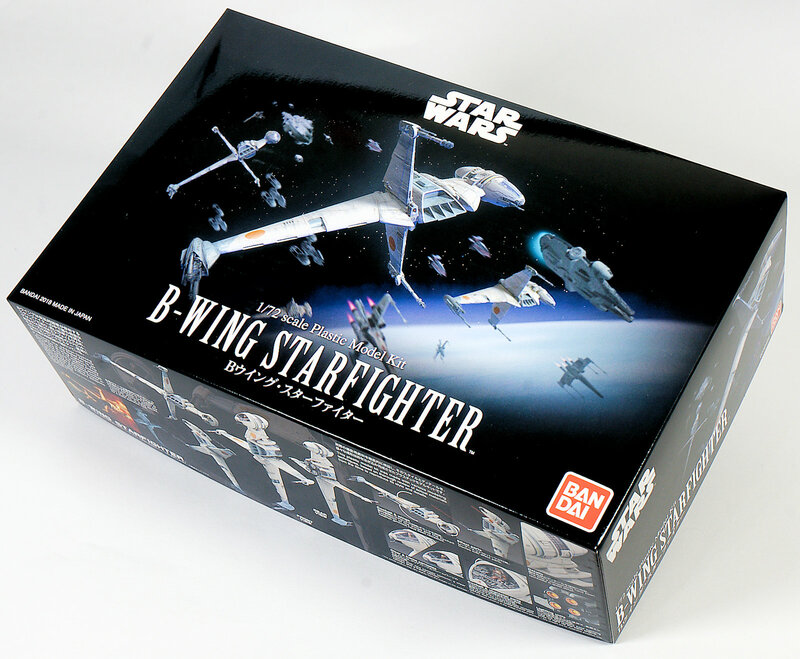 We had been calling out for more Star Wars ships from Bandai after their success with the Snowspeeder, X-Wings and Tie Fighters, Now the news of the new-tool B-Wing Starfighter brought out the real "closets" amongst us. 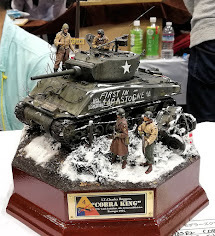 Quite a large number of people were well pleased with the announcement of the new kit in 72nd scale this time. Here is the box cover for the SDCC - print out your own! 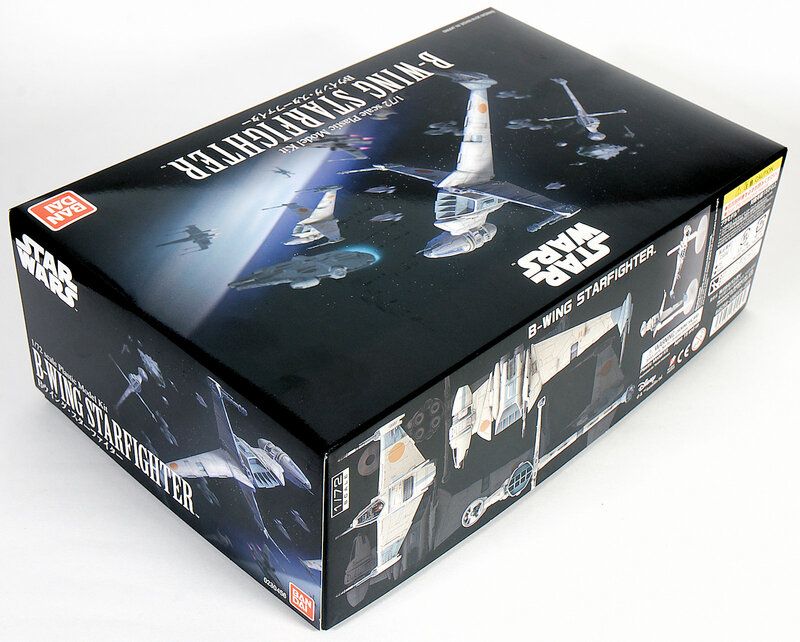 The version I have here is the regular boxing, with artwork on the front of the kit which I like better than the "exclusive" version in just black letters. Heaps of features adorn the sides of the box and it looks very much in line with Bandai's previous line of Star Wars vehicles. 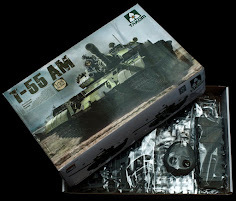 The box was actually smaller than I expected - measuring 30cm long by 19cm and 9.5cm "tall"
Inside the box, you find eight sprues of various colours (sometimes on the same sprue) of injection moulded plastic. 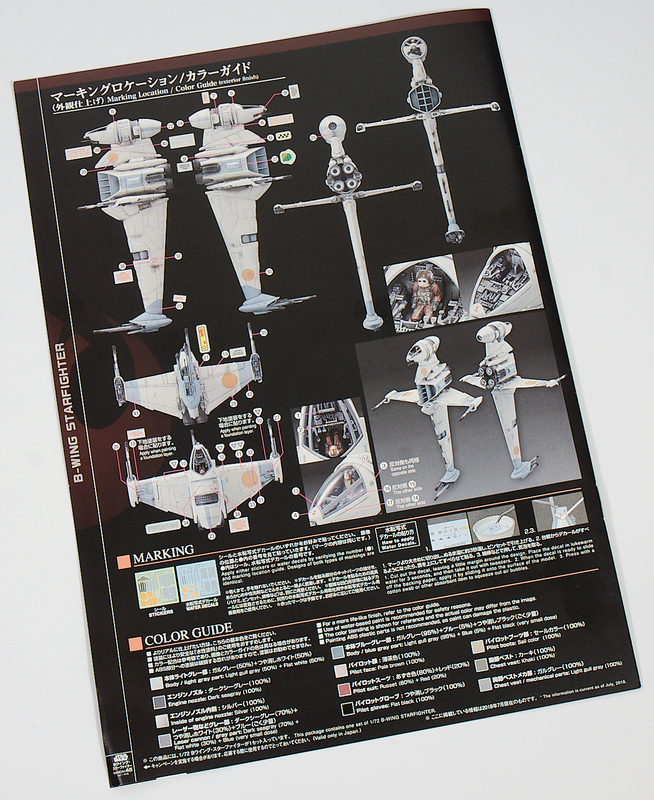 A (coloured cover) instruction booklet. 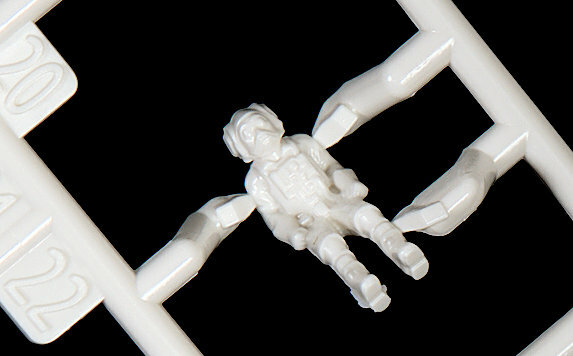 These make up the B-Wing, the clear laser effects, a canopy, a clear stand and a pilot. 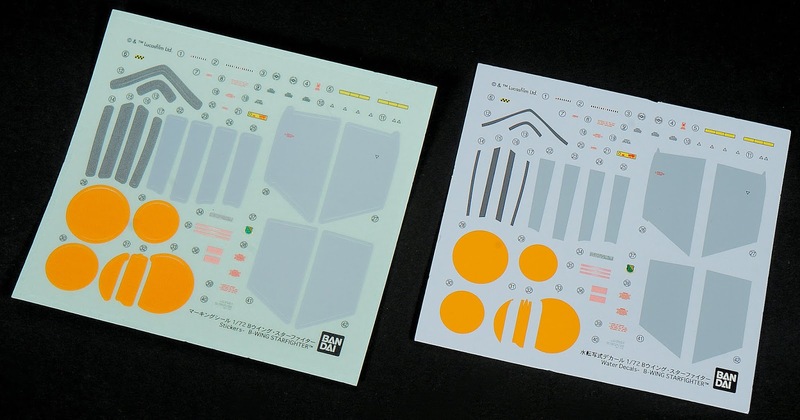 The kit comes with either stickers (for those who prefer crayons to pencils) or waterslide decals, it is your choice of course... The stickers are here below on the left, Decals on the right. Both are in register and I think Bandai has tried to colour match them properly. If I paint this I would make masks for a lot of the markings. 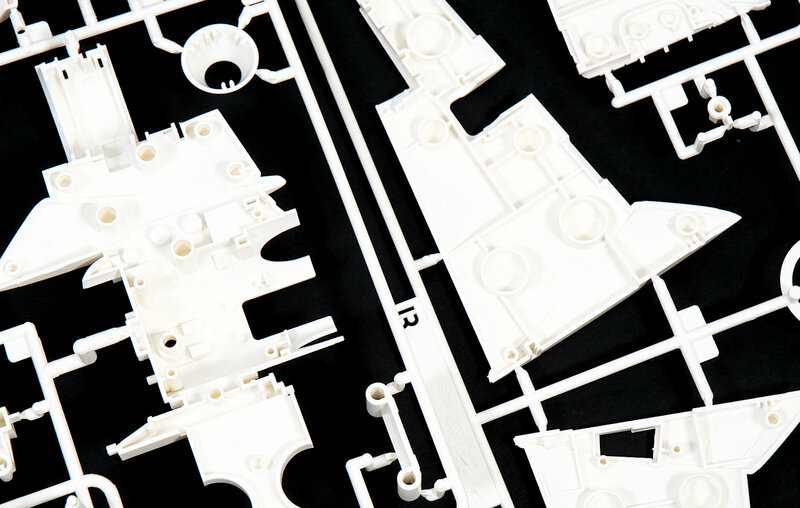 Eight sprues in all, some, like sprue A are multi-coloured with even clear transparencies thrown in which is impressive. 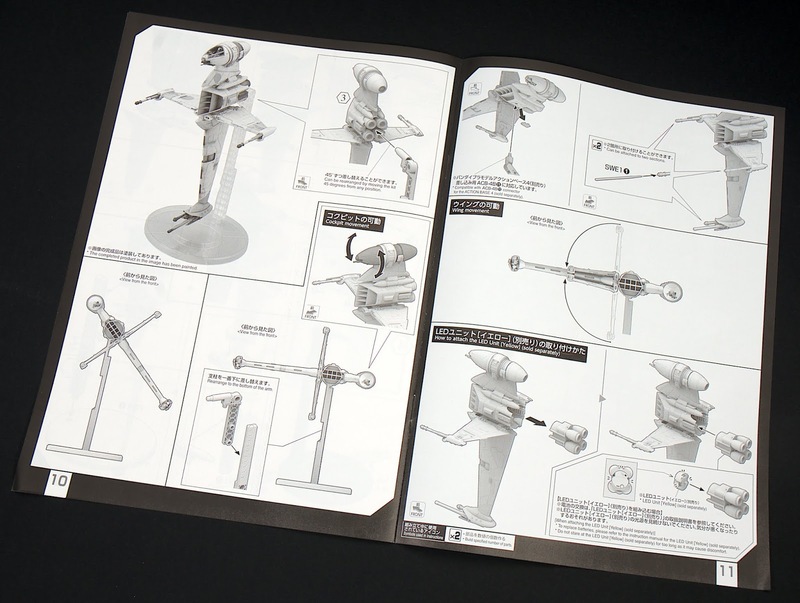 I will go through them one by one pointing out the particulars of each including the condition of the runners and plastic. 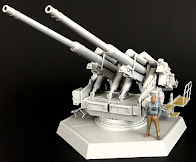 This is by far the largest sprue int he box, and for me the most impressive because of the moulding technology displayed in the different shades and types of plastic included. 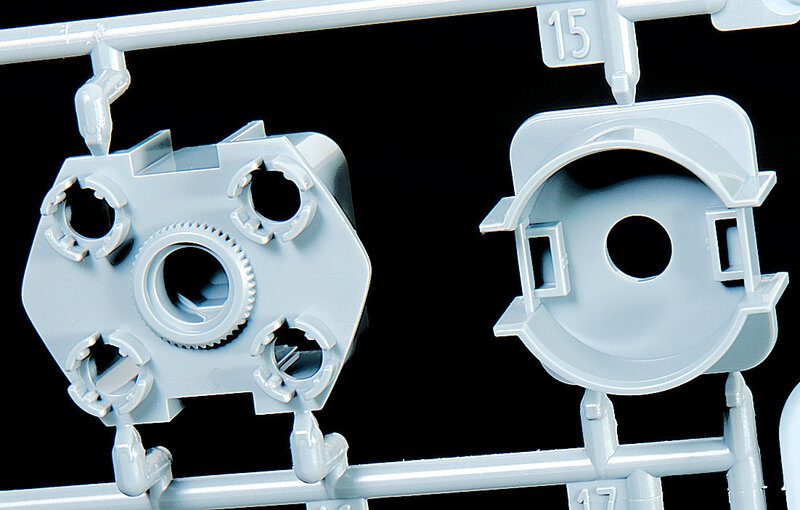 Light grey, Duck Egg Blue, White and Clear sprues are all joined together here on this one runner! The part that I had to see straight away was the clear part for the canopy. This is a little thick but crystal clear. 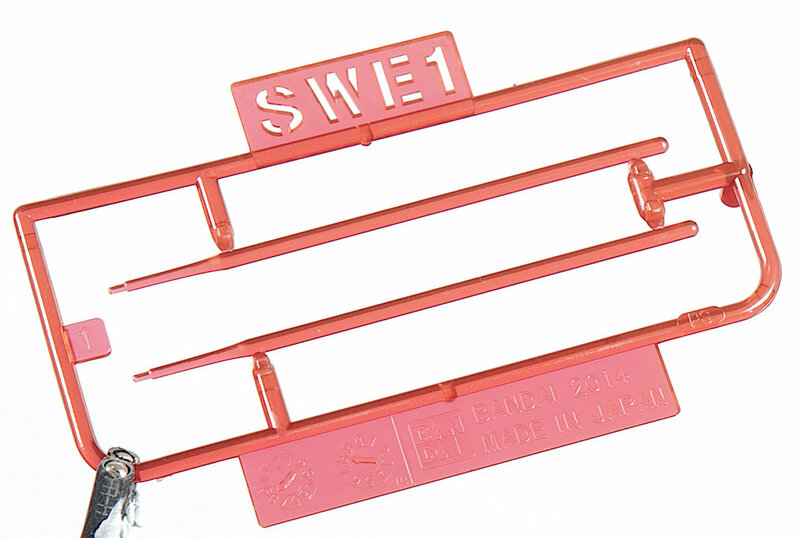 The frame is moulded into it as you might see on any aircraft model, while the plastic-free canopy frame is right next to it. 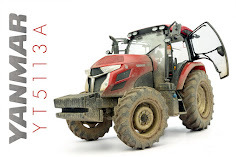 This is an option, not to be added on top of the clear canopy. I guess some people like that almost studio clear canopy without reflections. You can see below that the instrument cluster and controls of the pilot that are looking just great in this scale. 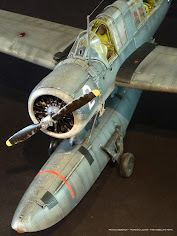 While we are talking about the pilot's controls here on the picture below (right) is the pilot's seat, with a mock-up electrical panel behind him, both again are well detailed in 72nd scale. You will notice that the seat has a large notch that is there to secure the pilot without glue. 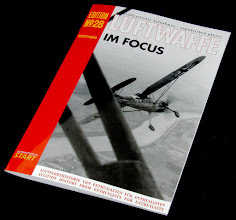 This will, of course, need to be removed if you want to show the kit without the pilot, although I am sure most will want to show this in flight. 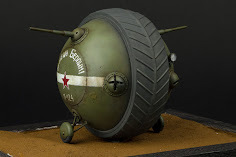 On the left of the picture below is the rear section of the pilot's capsule "cocoon" for a better word. One of the coolest parts of the design for me is the louvred cooling intake system for the centre front of the Starship. 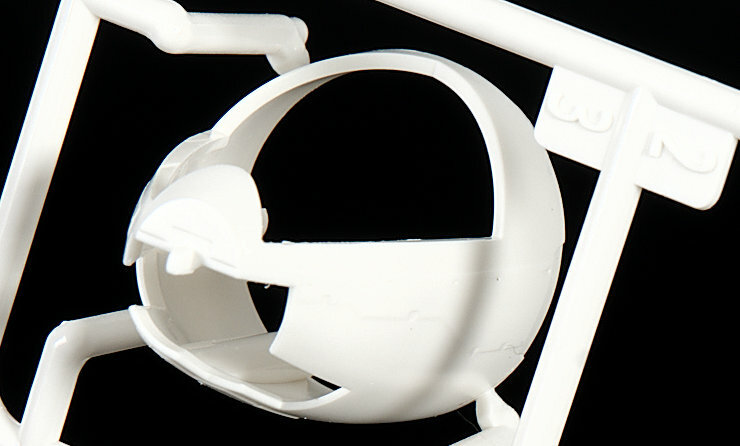 This is moulded in one part that slips inside the cowling. These two parts are the housing for the centre lighting set up. We will look at the installation of the LED in the build article, but these two simply slot into each other, and these fit into the engine cowling. 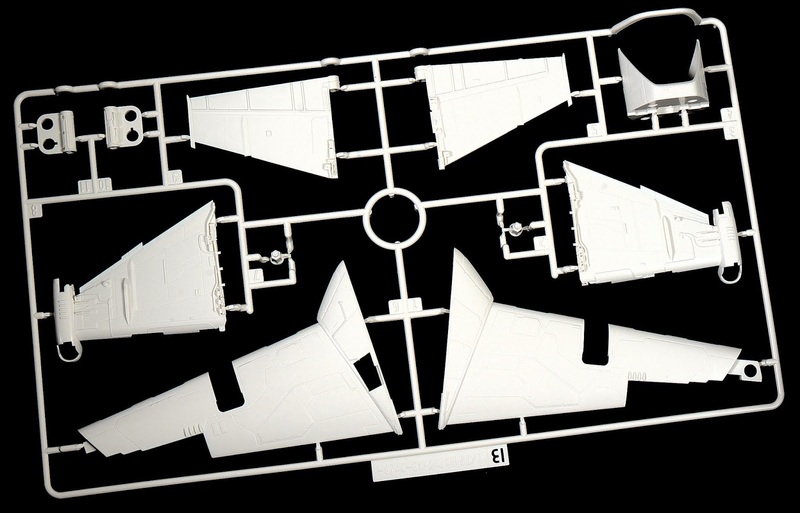 Housing the stub pivoting wings, the centre knife wing, the two pivots and the cooling intake housing, this sprue is made in an off-white colour that kind approximates but doesn't convince me of a dirty spaceship colour. It just makes it harder to photograph over light grey, but I see for the sticker brigade they have tried to match the colours of the original. Here below you see the raised and lowered panel, wiring and electronic equipment detail of the wings both horizontal or vertical (however you like to place them) of the kit. Hard to see here on dirty white against dirty white, but they look pretty good to this B-Wing fan and better than the older generation kits by a leap. The cooling intake shroud is here in its normal configuration, this encases the cooling lovers and fits straight on to the "fuselage" of the starship. Again plenty of details here that fit in well with the rest of the ship. This part's back is also notched so that it only fits onto the model the one way of to save us all from gaffes later on after it is secure. 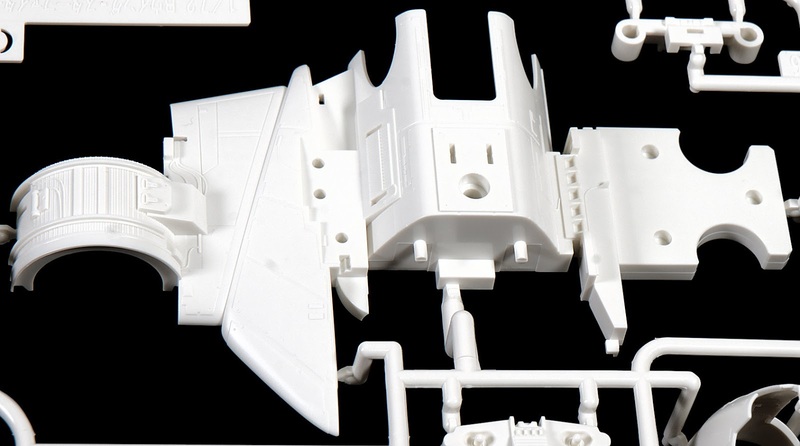 The third of the larger sprues is also moulded in that dirty white which looks crap in photos😅 - this one features the "fuselage" halves, the drop tank looking Krupx MG9 Secondary Proton-Torpedo Launchers, the forward and aft shell parts for the gyroscope cockpit cocoon and the pilot himself. In the build we will show you how these two fuselage halves just squeeze together, this is the main body of the Starship that acts as a pivot and anchor for the rest of the ship. Again we see plenty of raised and lowered panels, wires and electronic do-hickies moulded into the body. 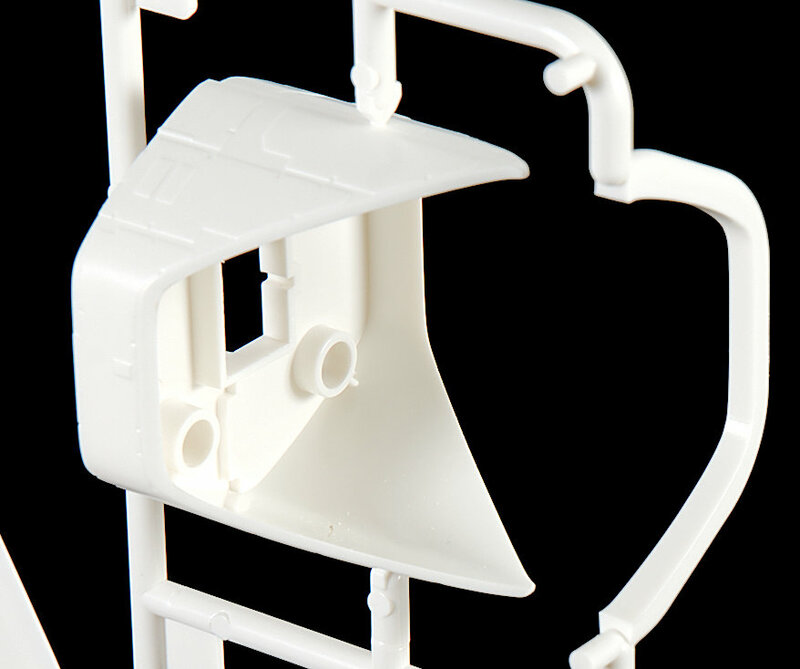 Here is the other side of the part showing the myriad of attachment points that secures this kit together tightly even without glue if you desire. The front cockpit enclosure slips over the cockpit tub. we will look at how this can be removed and painted after assembly in the build guide. 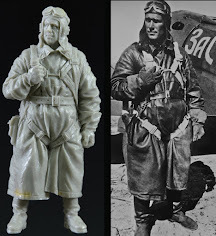 The Pilot: Maybe it is me, but I cannot see much detail in him. 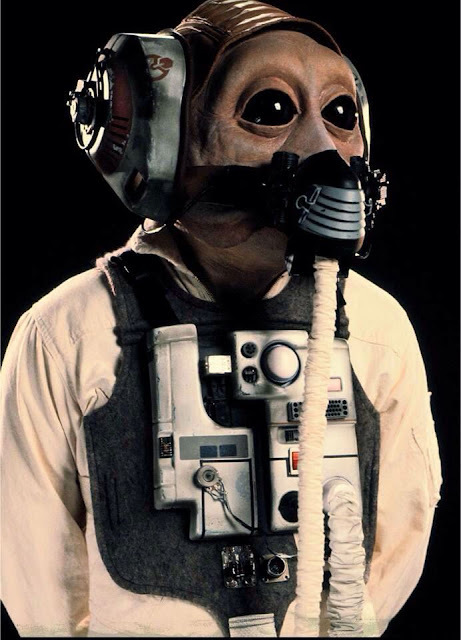 In the SDCC version, you get the option of a Humanoid pilot as well as this pilot which is a Sullustan pilot. 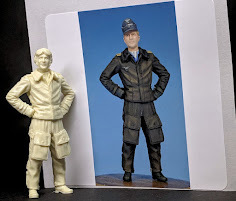 There are a few versions of colours you can paint him up in, but once the colours go into this figure he should detail up OK.
Sprue FB-1 is the generic clear stand that they have used with their other Star Wars kits. 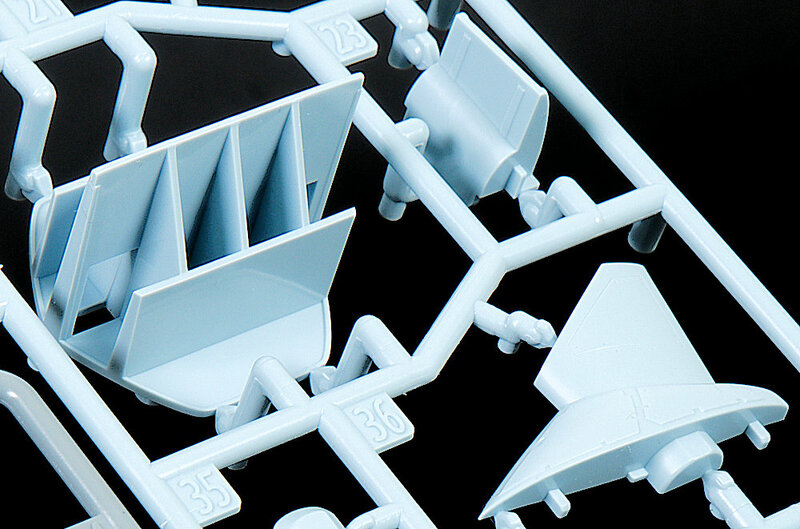 This occurred to me when I saw that the adapter part in clear on Sprue A has the adapter to fit this stand into this kit. 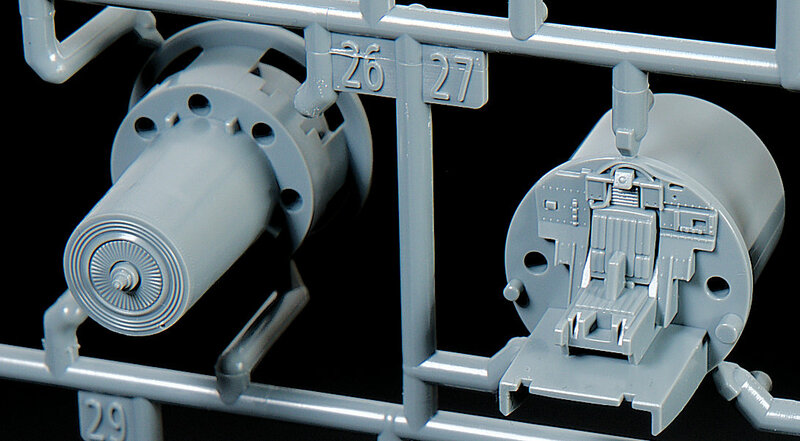 Some parts here are of course not used for this kit, and the nice clear round base has some connector points that need to be sanded rough, then smoothed out after you remove this from the sprue. 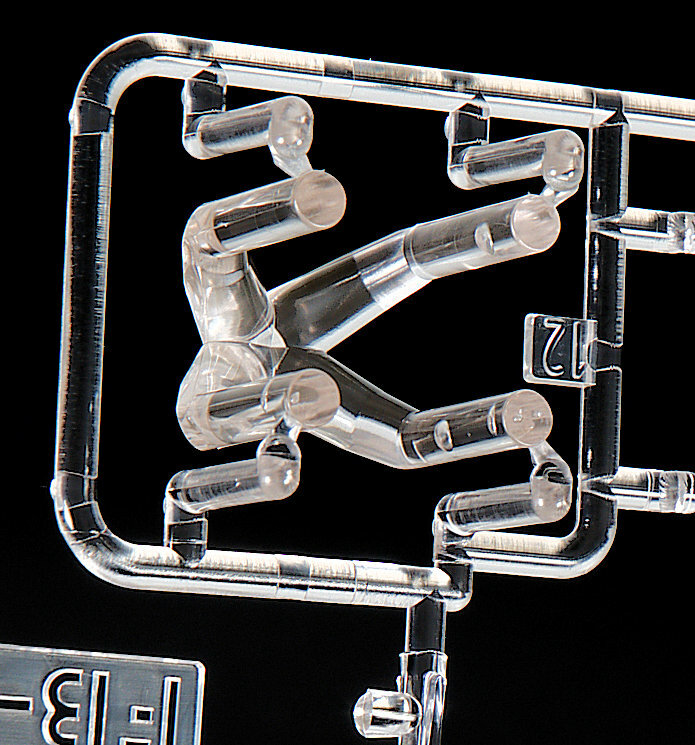 This clever part of plastic has four "legs" for a better word that shoots out from a flat central point into the LED that you may or may not add to the kit. If you do not light the kit I suppose you could paint the tips of these white then a clear orange over that to simulate the ignition. 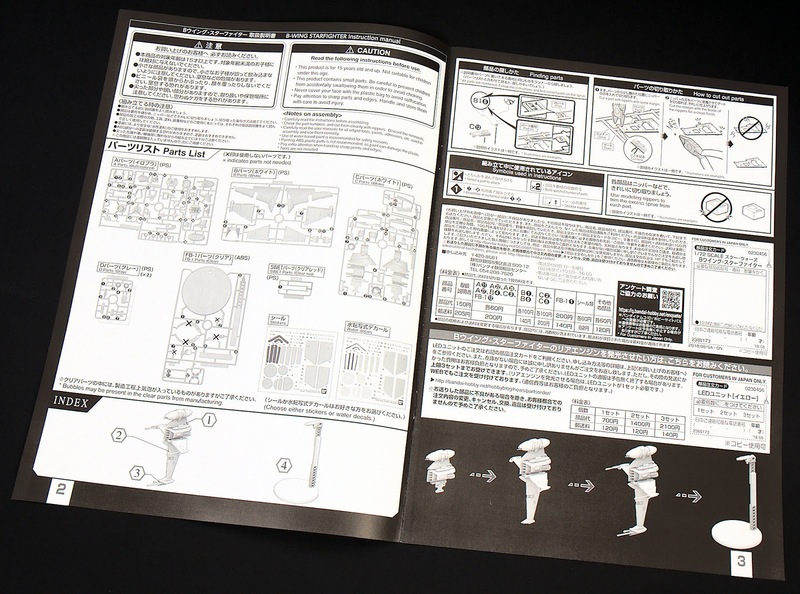 The booklet that houses the instructions a colour covered and black and white inside printed booklet. Thankfully this is not one of those large sheets that fold out as these are all over the place for me. 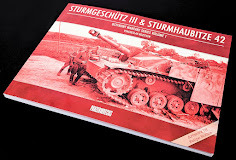 The colour cover showing a completed kit. 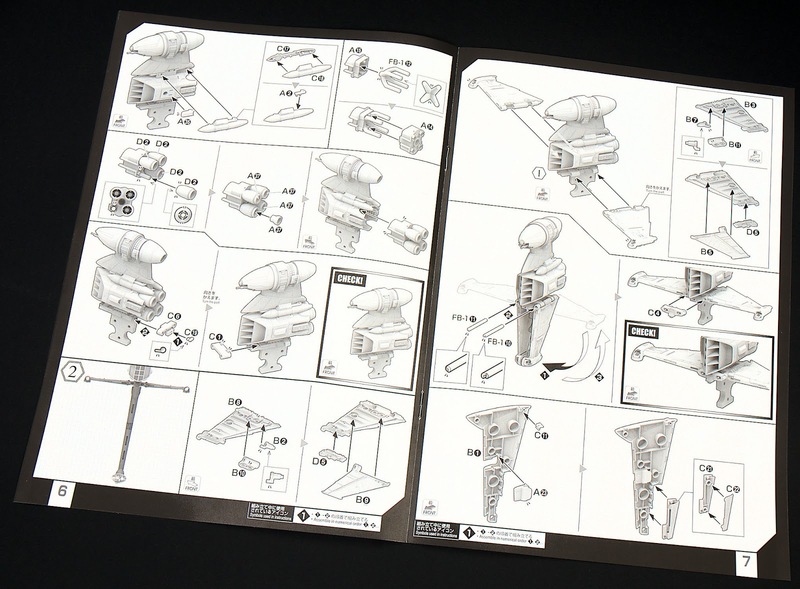 The instructions and parts tree map. Japanese text mostly, with some translated English in there also. 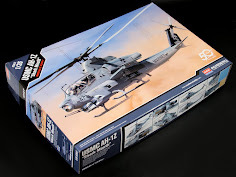 The steps are singled out from each other and broken down into simple steps, this is a great way to learn the kit. The centre pod and fuselage of the kit are laid out in these two pages, We are nearly already finished the kit. 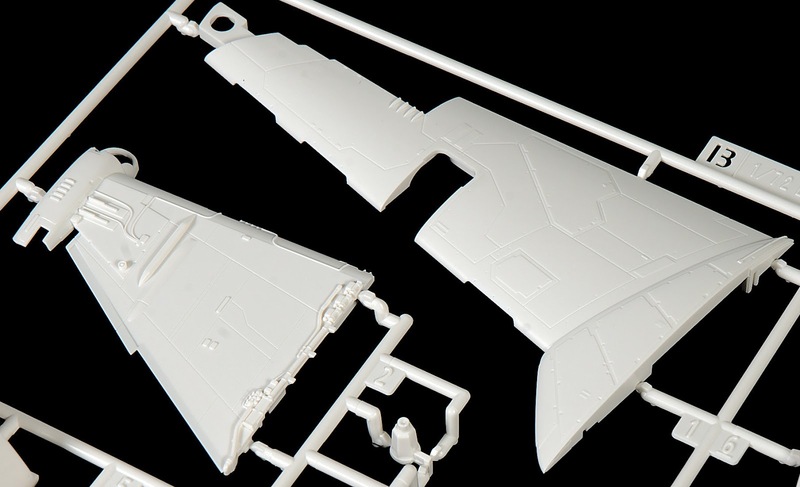 In the build article, we will show you what you can glue in so you can take a lot of the starship apart to paint it. 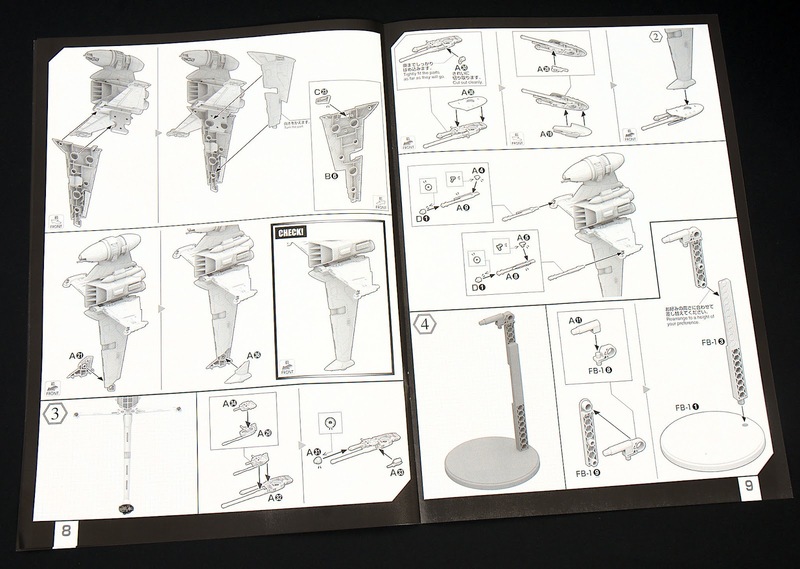 The last two pages concern the bottom wing or "sail" as I call it, the armament and the clear stand with the specific adapter for this kit and you are finished! 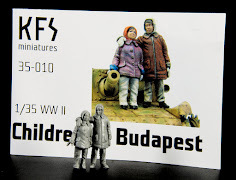 Simple instructions that feed info to you without clutter that make a simple build. 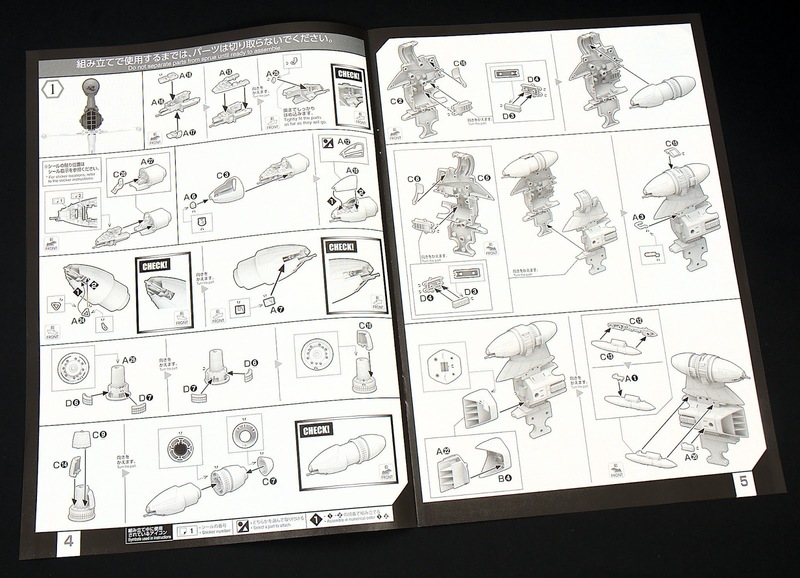 Ohh - nearly forgot, this last page shows you how to instal the LED engine lights into the kit. One would suggest that if you want to use this you would be thinking about this earlier in the build huh? The rear coloured cover shows the paint colours, the placement for the decals or stencils and some of the options of the kit from lots of angles. So that is all that is inside the box. 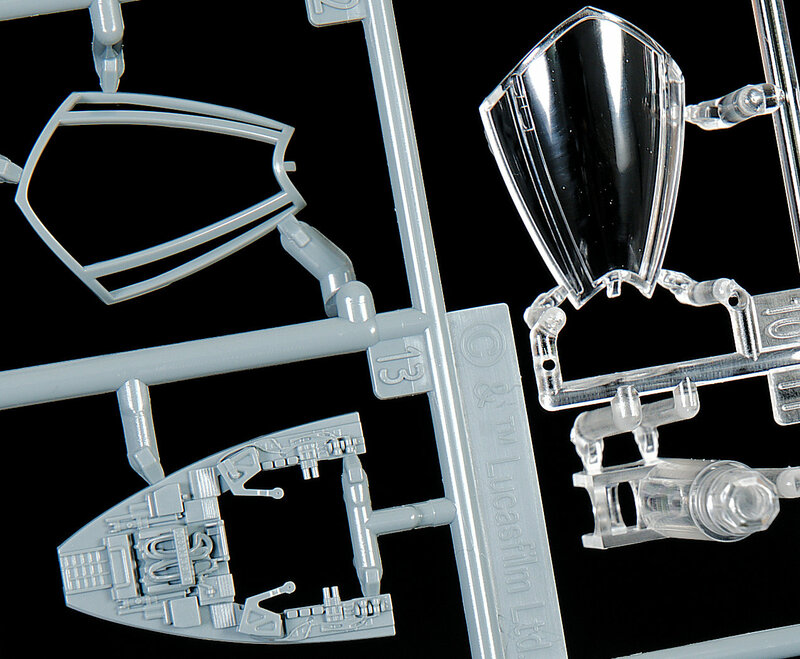 I am impressed with the options, the look of the detail on the kit and the simple assembly on offer. By now Bandai has this down pat, so buy with confidence if you like their earlier spacecraft, this is of the same ilk. 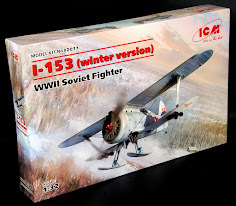 We have already made this ki tin two lazy afternoons, and next week we will show you how it goes together, the LED installation int he engines and the parts that you can and can't glue together so you may take the kit apart and paint it at a later date. 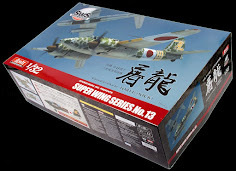 This kit came from The Tokyo Model Detective - he has some of the best prices and earliest availability for these kits anywhere online.